In Al-Zarian’s apartment, Hamid appears to be unconscious. In another room, Jibraan is tied to a chair. Tony asks his female accomplice how long before everything will be set. The woman is busy typing on her laptop, fabricating evidence to show Jibraan is responsible for the upcoming attack. Jibraan asks Tony why they are making him look like a terrorist. Tony threatens to kill Hamid if Jibraan doesn’t comply. Tony comments that if Jibraan cooperates, he will let him and Hamid live. Jibraan grows quiet. Tony instructs Jibraan to read a statement in front of the camera, which is now set up in the apartment. Jibraan refuses, but quickly agrees when Tony is about to shoot Hamid. Jibraan begins to cry. At FBI Headquarters, Chloe tells Jack that there is no chatter on the CTU servers. Jack wants Chloe to check out files on Muslim political activists. Janis argues that racial profiling is wrong. Jack says that he has no other choice. Jack begins to ask Chloe something, but loses his train of thought. Jack walks away. Knowing something is definitely wrong, Chloe asks Janis what is going on with Jack. Renee pipes in and tells Chloe that Jack was exposed to the biotoxin. Chloe goes to find Jack. Chloe is disappointed that Jack didn’t tell her the truth. Jack says that there isn’t a cure. Jack adds that he is dying and only has one or two days to live. Jack injects himself with the anti-seizure medication. Chloe apologizes for Jack’s diagnosis. Jack admits that he accepts his fate. Jack is adamant that Tony needs to be found and held responsible for his actions. Jack reminds Chloe that he can’t do this by himself. Reluctantly, Chloe agrees to go back to work. In front of the camera, Jibraan makes a statement about the imminent terrorist attack. Suddenly, a police cruiser pulls up outside. Tony tells the female accomplice to shut down the computer. Tony orders Jibraan to convince the cops that everything is okay. There is a knock on the front door. Jibraan answers it. One of the cops says that Jibraan’s neighbor called, complaining about yelling coming from Al-Zarian’s apartment. The cop adds that the neighbor saw some shady characters coming in and out of Jibraan’s place. Jibraan reassures the cop that the people are his friends and that they already left the apartment. The cop believes Jibraan’s story. Tony watches the police car drive away. Tony instructs Jibraan to finish his statement. Back at HQ, Chloe finds something on the server. Chloe tells Jack that two million dollars was withdrawn from an account in the last few minutes. Chloe gets a hit on Al-Zarian. Jack orders an APB out on Jibraan. Jack and Renee decide to check out Al-Zarian’s place of worship. Renee asks Jack if he is up to going out in the field. At the White House, Olivia gets a visit from her friend, Martin. Olivia tells Martin that she wants Jonas Hodges held responsible for Roger’s death. Martin asks for details, but Olivia is vague. Martin tells Olivia to let it go. Olivia gets defensive and tells Martin that he’s the last person to say anything. Olivia is adamant that Hodges has to pay. Olivia tells Martin that Hodges is in FBI custody, but will be transferred soon. Martin asks for Hodges’ itinerary. Martin says that he will be calling soon so Olivia can transfer funds to his account. Martin leaves the room. Olivia seems upset. Aaron glances in the room and sees Olivia’s panicked face. Janis tells Hodges that he is going to be transferred into Witness Protection. A US Marshal hands Hodges a dossier of his new identity. Hodges is mad that he has to give up his name. Hodges comments that he has worked hard to make a name for himself. The US Marshal leaves the room. Furious, Hodges throws the dossier at the door. Jack and Renee show up at Al-Zarian’s house of worship. A man asks them what they want. Jack says that they are looking for Jibraan Al-Zarian. The man lets them inside. The man explains that Al-Zarian worships there, but he is definitely not a terrorist. Jack doesn’t believe him. Jack demands to know where Al-Zarian lives. Renee gets a call from Janis. Janis reveals that a disturbance call was made concerning Al-Zarian’s residence. Renee tells Jack that they have an address. Jack handcuffs the man and the three walk back to the vehicle. In the apartment, Tony’s female accomplice says that the feed will be uploaded soon. Tony tells Jibraan that they will be leaving shortly. Tony instructs Jibraan to say goodbye to Hamid. Hamid wakes up and doesn’t know what’s happening. Jibraan says that he’s a terrorist and has been working with Tony’s crew to plan an attack. Hamid isn’t convinced. Jibraan lies to his brother. Jibraan says that Hamid will have to tell the authorities that his brother is a terrorist. Hamid pleads for Jibraan to stay. Tony leaves a man behind to keep an eye on Hamid. Olivia receives a call about Hodges. The man on the other end says that Olivia needs to make a money transfer of $250,000. Before Olivia transfers the money, Aaron interrupts and says that Henry has been brought back to the White House. Olivia changes her mind and cancels the transfer. Olivia calls Martin. Olivia leaves a message and says that she decided not to go through with it after all. Jack, Renee, and the handcuffed man are in the vehicle. Chloe calls Jack. Chloe says that she found evidence that Jibraan is being framed. Jack uncuffs the man. The man is impressed that Jack is able to admit he was wrong about Al-Zarian. The man tells Jack that he needs to forgive himself. President Taylor pays a visit to Henry, who is now at the White House. Olivia comes in and hugs her father. Henry says that he is happy that mother and daughter are speaking again. Olivia admits that she accepts the Hodges situation. Olivia apologizes for her behavior. Jonas is sitting in a wheelchair preparing to leave HQ. Hodges pulls out his wallet and looks at a photo of his family. The US Marshal takes Hodges’ wallet. The US Marshal wheels Jonas out to a vehicle. Once inside the vehicle, Jonas pulls out a photo that he has hidden in his shirt. Ten feet away, the US Marshal is asking a guard to fill out transfer papers. All of a sudden, the vehicle explodes. The US Marshal and the guard are thrown back from the explosion. In the Oval Office, President Taylor, Olivia and Tim are waiting word on the terrorist situation. Tim gets a call about Hodges. 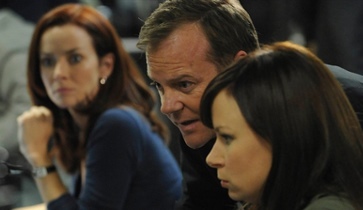 Tim tells Allison and Olivia that Hodges was killed in a car bomb. Olivia appears shocked. Olivia quickly leaves the room. Tim confides to Allison that it had to be an inside job. Allison is outraged. Olivia appears upset. Aaron asks if she is okay. Once alone, Olivia calls Martin. Olivia is frantic and says that she changed her mind about Hodges. Martin tells her not to say anything incriminating on the phone. Martin asks to meet in a park. Olivia agrees to meet him later. Olivia goes back into the Oval Office. Renee and Jack show up at Al-Zarian’s apartment. The FBI team is already set up outside. A camera is showing the contents of the apartment. The man from the house of worship verifies that Jibraan’s brother, Hamid, is inside. Renee tells the man about Jack’s exposure to a biotoxin. The man asks Jack to save Hamid. Jack and Renee begin to enter the premises. The team manages to get through Jibraan’s front door. Due to the distraction, Hamid is able to get up and break a mirror. Hamid grabs a shard and stabs his captor in the throat. Jack yells that Jibraan isn’t a terrorist. Hamid realizes that he shouldn’t have stabbed Tony’s accomplice. The man is beginning to bleed out heavily. Tony and his crew are in a van. Jibraan asks what is going to happen. It appears that Tony is targeting the subway system.